We know, from historical records, that the 15th century parish church at Liscartan was built on the site of an earlier church. This is an, 17.5 metre long, undivided nave and chancel church, with repairs and additions made in the 18th century. 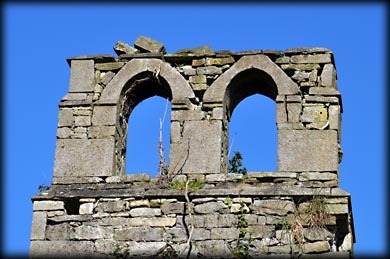 The three round headed windows in the south wall and the two in the north wall were added at this time and possibly the double belfry on the west gable. The real gems at this site are the original 15th century double-light cusped ogee-headed windows in the east and west gables. The superb tracery of the west window can be viewed in the image above. The interior of the now roofless church is overgrown. 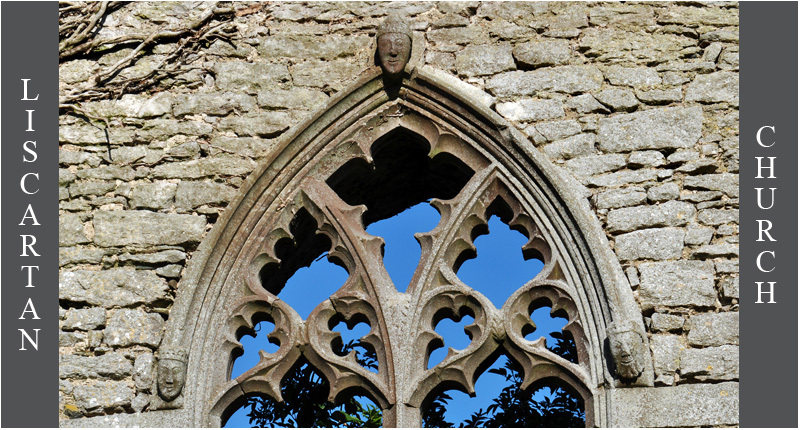 The image above features the west window left, and three carved heads that decorate the hood moulding. The are, from left to right, the heads of a queen, a bishop and a king. The double belfry is pictured below. Please ask for permission before entering the field. A badly overgrown tower house stands 60 metres to the east of the church. 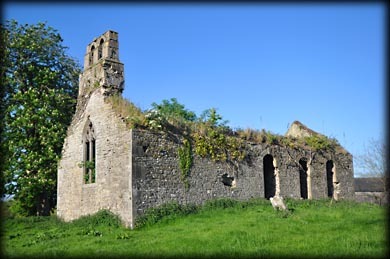 Situated: From Navan Town head north-west on the old Kells Road, R147. The Church is standing on private farmland on your right, 3.2 kilometres along the Kells Road. Discovery Map 42: N 8389 6957. Last visit May 2017. Longitude: 6° 43' 50" W.
Latitude: 53° 40' 9" N.